When you speak about fusion within jazz, it’s usually about that genre which was very big in 70ies and 80ies. Fusion can also be understood as a mixture. Robin Taylor is a fusionist who creates musical collages. He mixes different styles and pieces of music, sticks them together until it’s almost a micro symphony. In 70ies this was something you heard from different people like Emerson, Lake & Palmer and Mike Oldfield. Robil Taylor is a jazz-rock-shark, who preys on this genre. When you hear a number like Munich, the thought of collage is very evident. He weaves different parts together: in the beginning you enjoy Karsten Vogel’s soprano saxophone and delicious keyboards. After that it’s a juicy tenor saxophone played by Jakob Mygind with an organ underneath. All on top of stadion-rock-drums from Klaus Thrane. Then it’s a fine female voice and that’s the way it plays for the first 10 minutes. Shifting and changing in different parts . Robin Taylor himself plays bass, guitar, keyboard and various on the album. He gets assistance from the musicians mentioned above together with trumpet player Hugh Steinmetz who has a beautiful intro on the opening track Floating Rats. Guitarist Jon Hemmersam is on the album too, where he plays a string of solos. Maybe this current album is the best jazz-rock-album Robin Taylor has released (he has done some very interesting free-jazz-albums too). He is wandering in many different directions at the same time, but somehow he finds his way home, while he is telling an exciting story which keeps your ears occupied. it’s also worth mentioning that Taylor is making a comment on Danish military actions in Afghanistan with the title Jens in Afganistan. It starts with a long march on the drums added a trumpet and a kind of poor flute on the keyboard together with politicians speaking on top of one another. It is a strain to listen to it, but then after three minutes the number unfolds in a wild-and-cool-Miles-Davis-jazz-rock-inspiration. 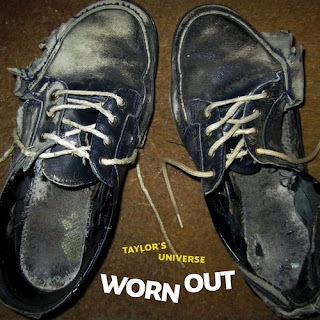 So even if the shoes on the cover of Worn Out and the genre Robin Taylor inhabits aren’t as fresh as a Mac-computer, it still is a relevant album. Especially for people who are addicted to grand and symphonic jazz-rock.